17 June 2015 | “Those are things of your white people,” says Richard Baalow when I ask him how he plans to sell his carbon offsets to corporate leaders. Baalow is a member of a hunter-gatherer group called the Hadza, known as the “last of the first” – the approximately 1600 remaining members of the first known people to live in what is now Tanzania. He’s traveled from his homeland, the Yaeda Valley, to Arusha to speak to me via Skype. But the long story is worth telling, too. Even before Baalow met Marc Baker and Jo Anderson of the Arusha-based non-profit organization Carbon Tanzania, he had heard about REDD through the Dutch’s government’s presence in Tanzania. The acronym stands for “reduced emissions from deforestation and degradation” of forests, and it’s applied to a broad range of activities that cut greenhouse gas emissions by saving endangered rainforest. Communities like his can earn money for the carbon they keep locked in trees, and Baalow was eager to learn how the Hadza could participate. The Hadza, whose culture can be traced back 40,000 years, have lost about 90% of their traditional homelands. As a non-aggressive hunter-gatherer group, “their response has always been to move. Just get out of the way,” explained Baker. The Hadza moved out of the way 3,000 years ago during the Bantu expansion throughout West Africa. They moved out of the way again about 300 years ago, for the Maasai. The Yaeda Valley. | Photo courtesy of Carbon Tanzania. Today, pressure is coming from Sakuma farmers and Datooga pastoralists, or herders. Habitat for the mammals that the Hadza hunt with bows and arrows – everything from giraffe to zebra to baboons to bats – is dwindling. The Hadza needed a plan, and getting paid to conserve the natural resource base they live off of sounded like a good one. “There is a new food for the world, and it’s called REDD,” Baalow said. Before the Hadza could earn money for the carbon stored in the Yaeda Valley, they had to prove that they owned the land they had been living off of for millennia – and establishing that ownership could provide benefits well beyond the carbon income. “Before this project, nobody had any rights,” Baalow said. 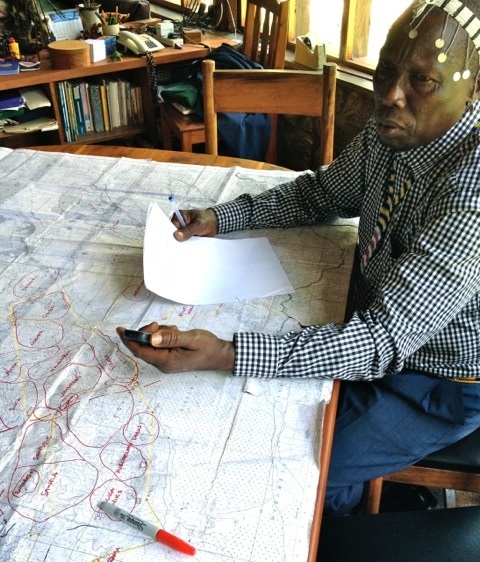 Richard Baalow works on a map of the Hadza territory. | Photo courtesy of Carbon Tanzania. Land reforms of the 1990s led the Hadza to formalize two “villages” so that they could secure communal land rights under the Ministry of Lands. But by 2009, so many outsiders had moved into the villages that the majority of the representatives on the Village Council were non-Hadza. Baalow began working alongside legal advisor Edward Lakita at the Ujaama Community Resource Team on a different solution. They decided to try a legal instrument called the Certificate of Customary Rights of Occupancy (CCRO) that had previously been used in Tanzania to formalize land rights for individuals. The Nature Conservancy (TNC), another partner in the project, paid for lawyers and meetings. It took years, but the Hadza eventually convinced the Tanzanian government to issue a CCRO to an entire community. In 2011, the Ministry of Lands issued the first-ever group CCRO, and the Hadza’s ownership of 20,000 hectares was finally on the books. 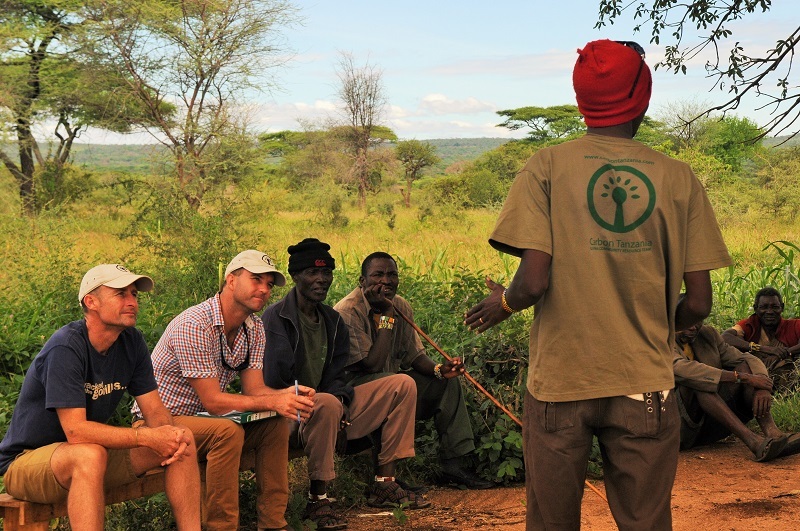 Baalow has traveled to several international indigenous peoples forums to speak about the process, and the Ujaama Community Resource Team has since worked with about 20 communities in Northern Tanzania to secure community land rights in the same way. Several of those CCROs went to the Sakuma and the Datooga – the neighboring groups who themselves were being pushed into Hadza territory partly because of insecure land rights. “There’s this chain reaction,” said Brown. The CCRO serves as the first-ever land-use plan for the Hadza. “As I see it, the CCRO has designated rights for different community user groups – the hunters, the farmers, and the pastoralists,” Baalow explained. “REDD is the distinction between plan and no plan,” says Marc Baker. | Photo courtesy of Carbon Tanzania. The various land-use rights are based on practical considerations. Flat areas with higher organic soil content and less exposure to easterly winds are designated for agriculture. Wooded areas around important water sources are designated as protected. And so on. 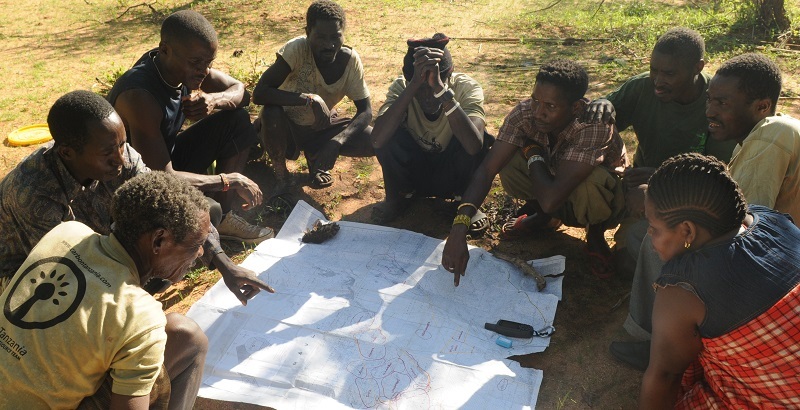 These “zones” do not impose on the Hadza’s way of life – they are still no fences, no permanent settlements – but they do guide decision-making around land-use within the Yaeda Valley, and they give the village governments parameters when granting farming areas to outsiders. The REDD-based land-use plan now covers more than 27,000 hectares. It would take a few days to walk across the project area. 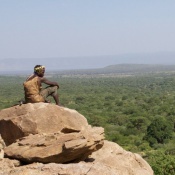 Now that the Hadza had secured their land rights, the next step was quantifying the carbon in the Yaeda Valley landscape. This was where TNC offered the most technical assistance – and where things get a little geeky. Carbon Tanzania worked with the Hadza to measure the carbon content of their woodlands. | Photo courtesy of Carbon Tanzania. The TNC team started with Landsat aerial imagery of the valley available through the U.S. Geological Survey, which captures the landscape at 30-meter resolution. For some areas, they used Google Earth to fill in gaps. TNC then sent out a team to take photographs at 100 different sites on the ground and manually classify them as different types of land uses: woodlands, agriculture, etcetera. They used the photographs to “train” a computer program to classify the entire map. “We did that for 2013 and then we used the same points and looked at the 2000 imagery and basically were able to figure out what areas had gone from natural grassland or natural forest into some degraded state,” said Brown. The verdict? The rate of forest loss in the Hadza territory was about on par with forest degradation in Tanzania as a whole – about 1% per year. This is the baseline for the “business-as-usual” scenario. The Carbon Tanzania team followed up this work with a carbon stock assessment that involved going out into the field and measuring trees to figure out the amount of carbon stored in the African savannah woodland forest. It hadn’t been done before, so the team developed a new statistical program to determine the carbon stored in different tree species. The Hadza helped with the physical tree measurements and with identifying plants. At the end of the study, they estimated that, at the current degradation rate, the landscape would release more than 15,000 tonnes of carbon dioxide (CO2) into the atmosphere annually. The majority of the aboveground carbon in the Yaeda Valley is stored in these acacia trees, according to Baker, so the fact that land-use planning protects and maps these trees can result in “a massive carbon saving.” Through REDD, the Hadza could earn sellable “offsets” for preventing that loss. The Yaeda Valley Carbon Tanzania project is developed under the Plan Vivo carbon standard, which focuses on community-led projects benefitting smallholders. To date, the project has earned 48,033 Plan Vivo certificates, each representing one tonne of CO2. Buyers include National Geographic Travel and Abercrombie & Kent, as well as local tourism companies such as Dorobo, Map’s Edge, and Nature Discovery that do safaris or adventure treks in the region. Carbon Tanzania also works with international carbon offset retailers, including U.S.-based Native Energy and Sustainable Travel International and Sweden-based ZeroMission. The not-for-profit is in the process of hiring a business development manager who will focus full-time on sales now that the project is up and running. Under the Plan Vivo standard, at least 60% of revenues from the carbon sales go directly to the community. The remaining 40% is split between project monitoring and overhead. REDD payments reach the Hadza through M-PESA, a mobile phone money transfer system used widely in Tanzania. The most recent revenue of 21,550,000 Tanzania shillings (about $10,200 USD) from carbon offset sales between May and October of 2014 was split evenly between the two villages in the project area – Domanga and Mongo wa Mono. Going forward, Carbon Tanzania expects to generate $60,000 for the communities annually. The Hadza use the money to pay the wages of 20 scouts that patrol the protected area, gathering data and documenting any illegal poaching or land incursions, as well as two village coordinators. Between 2013 and 2014, these scouts dealt with nine instances of cattle incursion and seven instances of poaching – though poaching instances involving guns have been reduced to zero. Aside from the scout salaries, the communities meet every six months to decide how to collectively spend the remainder from the carbon payments – usually on maize meal and school fees. They’ve also set up a medical fund that acts as community insurance, covering medical expenses for first-time mothers. “The biggest benefit to come from Carbon Tanzania is that the communities have seen the value of environmental conservation and are able to earn money by conserving nature,” said Baalow. Now that the project is in its fourth year, the Hadza have gained confidence that REDD payments actually will flow – and that monetizing carbon has led to many other outcomes that have non-monetary values such as land security, biodiversity protection, and a reduction of conflict between farmers and pastoralists, according to Baker. 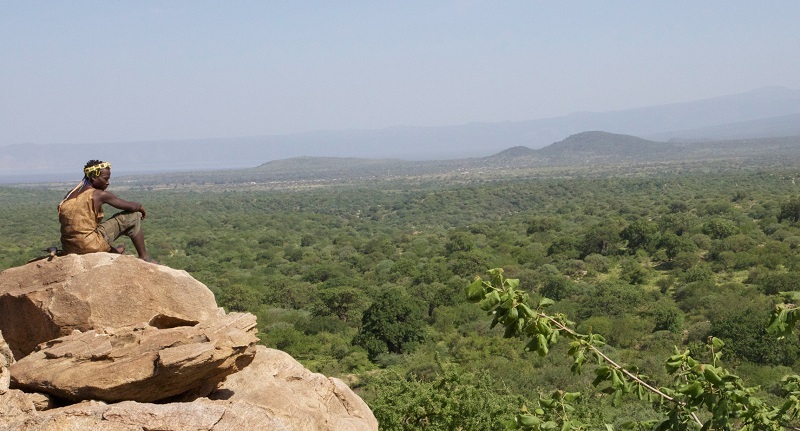 Carbon Tanzania is in the process of expanding the Yaeda Valley project to cover more land area and is also working on a new REDD project in the Makame Wildlife Management Area, with the Maasai. Tabitha Muriuki contributed to this story. Allie Goldstein is a Senior Associate in Ecosystem Marketplace’s Carbon Program. She can be reached at agoldstein@ecosystemmarketplace.com. Tabitha Muriuki is a free-lance writer based in the Netherlands. She can be reached at tabitha@muriuki.nl.